Hello! 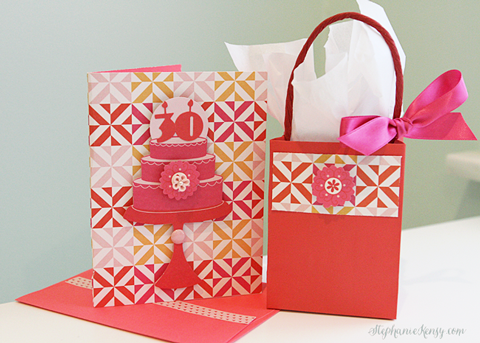 Stephanie here sharing a card and mini gift bag I made using the Club SEI March card making kit. The Neon Vibes collection is so fun for spring and summer. I'm loving the energizing colors and patterns. The kit comes with supplies you can use to make spring and Easter cards, but that's not all. 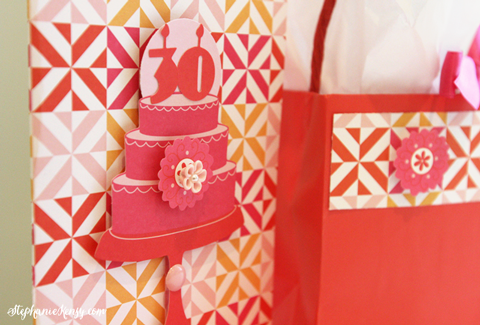 There are birthday-themed sentiments, stickers and die-cuts too, so you can use this kit year-round. I also dressed up the envelope and a mini plain red gift bag to match. You can find these bags for about a dollar or less at Michaels or AC Moore. They're always in my stash. This tiny size is perfect for holding a gift card. I use them all the time ... a little more special than just placing the gift card right in the greeting card. Add some patterned paper scraps and a sticker, tie a ribbon and you're party-ready!